Captain Gasch aka "Captain Throttles" started at the age of 8, working the bay several years under several “Old-School Captains” that truly knew the ropes in the charter industry. Captain Throttles started Fish Stalker Charters in 2003 with the purpose of introducing and exposing kids from the city and surrounding areas to the Chesapeake Bay. He takes great pride in catering to the young anglers program. As Tim says, "I do this not only for a job but a career. Fishing is my true love thanks and Fish On!" Tim is an excellent captain, “knows his stuff”. 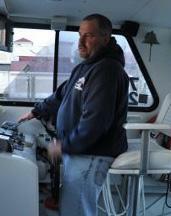 Excellent set up, the captain remains in the wheel house focused on the electronics and fishing strategies. Dave Teheran first mate deals with the rods and the fishing party and works very hard. All in all a great trip even though it rained a bit. Caught our limit in less then 6 hours!